Rob & Jan T’s lives run full throttle between their kids, family & work. Always dreaming about a place for family to relax, let down and enjoy them, they decided it was time to create their backyard oasis for down time. Building off their existing backyard patio, they added an in ground pool with a pool house to complete their retreat. The pool house is their entertainment space for cooking, TV & video watching, listening to music and just hanging out. It is the perfect space for a party or quiet time to relax. This award-winning project is the perfect place for plenty of down time! 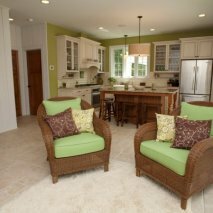 View our Facebook gallery of this project!